The Hampshire sheep acquired its name from the agricultural county of Hampshire in southern England where it was developed from a cross between Old Hampshire, Wiltshire Horn, and Berkshire Knot crossed with Southdown. They were developed in order to maximize the flocks on the less than viable soil of of Wiltshire, Hampshire and Berkshire. It’s interesting to note that bloodlines from the eastern counties of the downs have finer wool and more compact sheep, while those from the western downs were coarser. Hampshires were first brought to the United States in 1860, but all of the flocks were either destroyed or scattered during the Civil War. Importations in large numbers did not resume until the 1880’s. Hampshires are a large breed, with black faces and legs and wool on the legs and head. Their fast growth rate and superior carcass merit make them a popular choice to sire crossbred market lambs. Mostly white, the face, ears and legs are so brown they are nearly black. They are very durable sheep – they can survive less than ideal conditions, and don’t mind cold or hot weather without shelter. 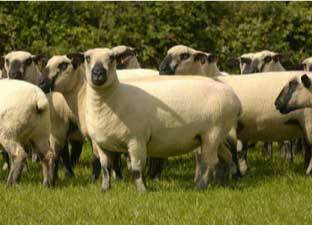 Hampshires are large sheep; very large sheep. Mature rams weigh in at a minimum of 300 lbs, and “petite” is not a word to describe the ewes; breeding ewes weigh at least 200 lbs. Thankfully, they have a mild disposition because in addition to their size, they are active sheep, but not easily excited. Emphasis in breeding is on muscle quality. feed efficiency and rapid growth (remember, these are meat sheep). Multiple births and balance in the overall look of the sheep – they look very blocky and strong, with very smooth clean lines – are also important. Hampshire do not need a season for breeding, though they generally do so in December or January; a healthy ewe having no difficulty in lambing and twins are common. Hampshire ewes are very protective. Hampshires have open faces and some wool below the knees. They are mainly white sheep, but colored Hampshires also occur and are judged separately. Regardless, a uniformly colored fleece is best. Breed standard requires a “good length” for the fleece – but a year’s growth should be about 8 lbs. Usually this means about 3” for a staple. The fleece should be uniform in texture across the animal and 54-60 spinning count (26-30 microns), it should be fine and very dense. The wool is hard wearing and is often blended with other wools to improve their durability. It’s also used to make fine felt – in this it is slightly unusual among down breeds.